László Moholy-Nagy, Wassily Kandinsky, Oskar Schlemmer, Kurt Schwertfeger, Kurt Kranz, Heinrich Brocksieper and Werner Graeff were shown on large original film projections. This footage revived the work of the historical Bauhaus and its people. Cinematic practices always played an important role at the Bauhaus based on Gropius‘ theory of “Science of Vision”. Movie experiments as well as documental footage show the school, living and working affairs. Especially these moving pictures give an excellent view of the idea of the Bauhaus style. In the programmatic prologue of the exhibition, three films reconstructed the opening of the Bauhaus building on 11th December 1926. We showed three historical educational films in substitution to the original film program of the exhibition opening. These include architecture, science and sports. 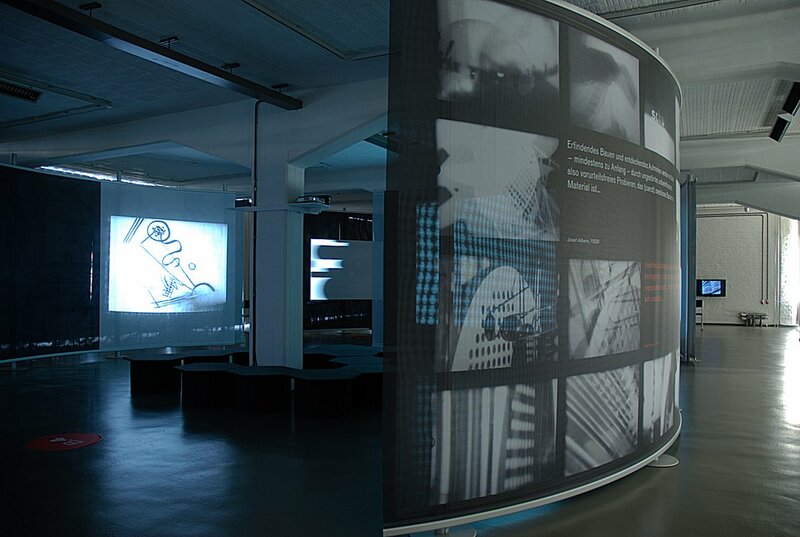 The main part of the exhibition was separated in thematic complexes to show concepts and ideas of the Bauhaus. Everything is about architecture, medial arts, stage/festival and migration. Afterwards, masters and students of the Bauhaus gave their point of view to the audience. Seven monitors showed interviews with Walter Gropius, Ethel Fodor-Mittag, Hubert Hoffmann, Eva Weininger, Hil (Wolf Hildebrandt), Ellen Auerbach, Pius Pahl, Gertrud Arndt and others. Beside artistic and political aims as well as everyday life at the school, the exhibition showed especially the conflicts that first led to the relocation of the Bauhaus from Weimar to Dessau and finally its closing by the national socialist. Parallel to the film exhibition László Moholy-Nagy’s “Raum der Gegenwart” was presented: a spatial installation, which experiments with diverse new communication media, such as film. The design for “Raum der Gegenwart” is a pioneering piece of work, which revolutionized the art of the environment, new media art, exhibition design and the history of the museum. Moholy-Nagy developed this visionary concept in 1930, but it remained unrealized. In 2009 for the Bauhaus’ anniversary “Raum der Gegenwart“ was reconstructed for the first time in a research project, led by Prof. Jakob Gebert and Prof. Dr. Kai-Uwe Hemken. In cooperation with the Goethe Institute the exhibition was presented in 2013 at the SESC Pinheiros in Sao Paulo and 2014 at the Museo Nacional de Bellas Artes in Santiago de Chile under the title “bauhaus.film”.